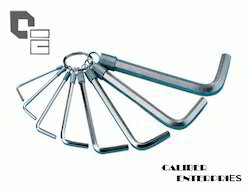 We are a leading Exporter of allen key from Mumbai, India. We are providing a wide range of Allen Key. Our offered Allen keys are procured from authentic vendors of the market, who follow industry standards in manufacturing. Due to their high functionality and durability features, our range is widely used across the country. We engaged in providing a distinguished collection of Allen Key that is known for excellent performance, durability and resistance to corrosion. Size (Dia) M1.6 upto 36 mm / 1/16" upto 5/8". Looking for Hex Key ?